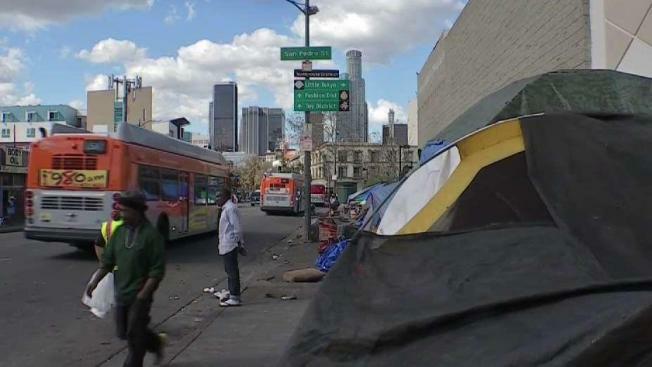 The Los Angeles Police Department said this month the number of crime reports that described people experiencing homelessness as either suspects or victims increased by more than 50 percent in 2018. Most notably the number of rapes attributed to suspects described as homeless increased by 78 percent and the number of serious assaults attributed to suspects described as homeless increased by 56 percent, according to the LAPD's 2018 fourth quarter report on homelessness. The homeless crime increase conflicts with an overall decrease in violent and serious crimes in LA during the same period, raising the possibility that the statistical change is more closely related to better data collection and analysis by the LAPD, city officials said. "We all have to bring it back — to, 'What can we do?,'" asked LA Police Commission President Steve Soboroff at a meeting Tuesday. He and other commissioners asked the LAPD what to make of the data and to suggest how the information could guide police policy. "Ideally what I would like to see is the commission set a goal, or at least establish some parameters or some goals," said commissioner Dale Bonner. Chief Michel Moore said the data had helped focus the LAPD's resources on homelessness issues that truly needed law enforcement intervention, such as the increase in expansive tent encampments in neighborhoods around the city. "We've also looked to our enforcement efforts, to identifying and holding accountable those who are engaged in criminal activity, particularly serious criminal activity like crimes of violence and preying upon neighborhoods, burglaries and thefts," Moore said. NBC4's I-Team reported last December that the number of crimes that listed homeless people as suspects had increased significantly in the first 11 months of 2018, based on an analysis of crime data obtained from the LAPD. In February NBC4 showed that those increases continued in the first month of 2019, with 920 incident reports filed by officers between Jan. 1 and Jan. 31 that described a suspect as homeless, or a 29 percent increase over January 2018. LAPD Commander Dominic Choi, who manages the department's response to homelessness, said last month while the data cited in the I-Team report was concerning, he explained there are reasons other than more crimes being committed that accounted for a portion of the increases. "There's an awareness and [people] are reporting more, our coding is better so we're capturing a lot more, and, quite frankly, there are more victims out there," he said. Officers began using more focused statistical tools in June, 2018 to better categorize crimes that touch the homeless community, and Choi said a full year of that data was needed before meaningful conclusions could be reached. That data will be in hand this summer. 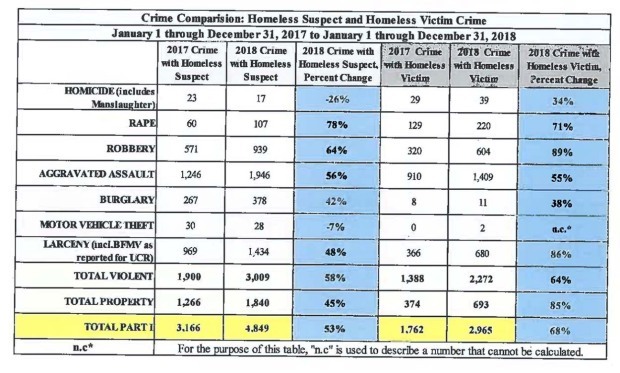 This table provided by the LAPD shows a crime comparison involving homeless suspects and victims.